Verrier: "We're just dedicated to propulsion." 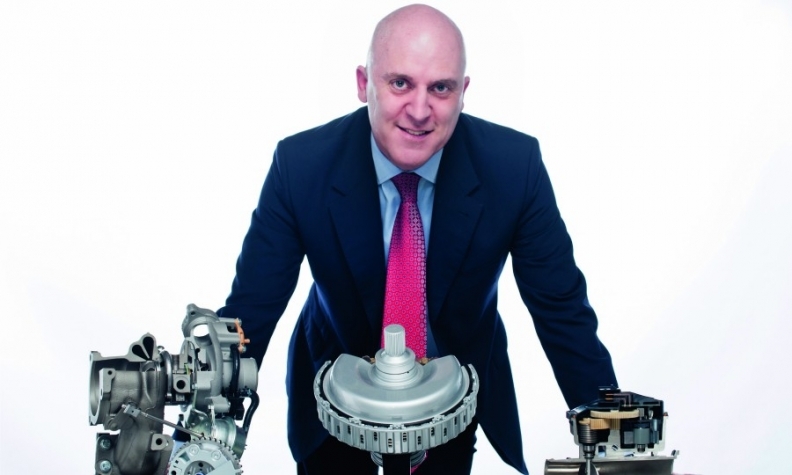 Not long ago, BorgWarner was at a crossroads. It needed to decide how much it would invest in electrified powertrains as well as determine whether it wanted to compete in the autonomous car sector. The supplier decided that to secure its long-term future it would leave self-driving cars to others as it focused on providing propulsion solutions to everything that moves. BorgWarner CEO James Verrier told Automotive News Europe Managing Editor Douglas A. Bolduc why he believes the supplier "can’t lose." What is your position with customers on the emissions debate? Three to four years ago we decided to take a very agnostic position. We're just dedicated to propulsion. We work with the automakers and support them on combustion engines, hybrids or electric -- whatever they would like. This is driving a lot of growth for us because we've got high content per vehicle on all of those. Do you continue to welcome the move to electrified powertrains? We've embraced it. In the past, we had a lot of debate about what percentage of the world's cars would be pure electric by a given time. We concluded that we don't know, therefore, we decided to stop talking and put our efforts into building a portfolio of products. We've done that over the last three to four years. Whether pure EVs have a global share of 1 percent or 5 percent or 10 percent, we've got products. It is the same for hybrids. What percentage of global sales will be pure EVs? There's a lot more conviction that 3 percent to 5 percent of new vehicle sales will be pure EVs by 2023. How do you feel about the move to autonomous cars and the rise of car-sharing and ride-sharing schemes? When we put ourselves in a neutral position on propulsion a few years ago we made another decision: We'll let somebody else figure out all the details of autonomous driving and ride-sharing and connected cars. We don't really know how autonomous cars or ride-sharing will work. What we do know is that they're all vehicles and they're going to move from point A to point B and the only way you can do that is with a propulsion system. We're going to serve those needs in a completely balanced way with combustion, hybrid and electric. I think we can't lose. Is the 48-volt mild hybrid a solution to the diesel decline in Europe and will BorgWarner gain from this? We're on the road today with 48-volt e-boosting technology so 48-volt is here and I think it's going to continue to grow, particularly in Europe. What market share is expected for these hybrids? Our predictions show they will account for 60 percent of the hybrid market by 2027. Will this reduce your turbo sales? In the past, the question was whether you go with a hybrid architecture or a downsized turbocharger? That's no longer the case. It's both. We see turbo penetration rates on hybrids being the same as they are on naturally aspirated engines -- even a little higher. More than 50 percent of all hybrids will have a turbocharger on them by 2027. What is diesel's future in Europe? We are in a mode where the diesel share is falling. I don’t think we've reached the bottom. We've gone from around 50 percent of overall new-car sales to the mid-40s. Where does it bottom out? Who really knows. It's probably in the 30s. Every night before I go to bed or every morning when I wake up, we've launched another product at BorgWarner. When you're doing that every day, you've just got to hope that every one of them has gone well -- and they generally do. The other challenge we face is making sure that we are at the leading edge of technology as this world moves forward in terms of advanced propulsion. We can never, ever take our eye off the ball and let somebody catch up to us or be better than us. How are you doing in those areas? We're doing great, which is why I sleep well, but you never stop worrying about it. I'm lucky because I have a team that is probably even more paranoid than I am -- and that's good. Are you really launching a product a day? Pretty much. It could be a very similar product that's part of a model changeover or it's a next-generation product. It could be a new customer. It could be a new technology, but, on average, we're launching a product every day. Is that every work day or every day? It's funny that you ask because when I started doing the job, it was every work day, but now it's calendar days. So, I don't even get Saturday and Sunday to not think about it (laughs). This industry never sleeps, right? Yeah, it's true. For those of us who have grown up in the industry, we know what it takes to launch a product: customer approvals, designing and testing and validating, getting the suppliers ready, getting the production equipment ready. You're doing that every day. And you have little margin for error, right? Yes. That's why we need such an incredible focus inside the company. Do other industries look to model what you’re doing? Our industry deserves a lot of credit because we're not the only ones launching something every day. Everybody is. Of course, there have been some disappointments with some of the recalls. But, if you look in the context of how many parts are being launched every day in the industry, it is mind boggling. We're proud of our system. It's very robust. It has to be. What is the reward for doing it right? Our customers wouldn't be giving us all that new business if they didn't have complete confidence in us. To have annual organic growth at a mid- to high-single-digit rate, it's $500 million to $600 million in new business every year. They wouldn't give us that business if they didn't have complete confidence in our ability to launch. It's a different kind of indicator, but it's a good one because if you're not growing, there's probably a reason. You either don't have the right technology or you don’t have a right launch performance. You've got to be competitive, and we are. Have you taken a hit from the rising cost of steel? It's a bit of a headwind for us, but not major. Our raw materials exposure was about $30 million to $40 million, but that's manageable. The steel price goes up and down so we have decent agreements with our customers to help us manage that. When you have discussion with governments about emissions what is your main message? Our main message to all the governments around the world is for them to be technology neutral. What they should focus on is a certain consumption and emissions rate, then let us worry about what the right technologies are to reach the goal. Don't pick the winners and losers. A lot of people say, "Oh, diesel is bad." Well, if diesels can meet the same requirements or, in some cases, be cleaner than other technologies, why would you say that's bad? Are suppliers gaining more power as automakers turn their focus toward autonomous, connected and electric cars? We're not in a mode of trying to get ourselves too front and center with the end consumer. I don't think people will walk into a dealership and say, "I'm here to look at your lineup of SUVs and can you make sure it's got a BorgWarner propulsion system in it?" We're not going to be that consumer oriented. Will suppliers be asked to do more? Automakers have to deal with autonomous, ride-sharing and more. What I've seen is that many customers are carefully looking at what they have to control and what can they ask a partner to do for them. They can't give up or outsource autonomous driving. It’s the same with the connected vehicle. What we have seen with several automakers is they're prepared to rely and trust a propulsion partner like us. We see that playing out a little more over the next couple of years. Some domestic Chinese automakers have said they are going to take care of their electric vehicle, but have said, "This whole propulsion thing, can you do that for us, please?" And we said, "Sure, we can do that for you." We provide the whole propulsion system. It varies a little bit regionally. You're probably not going to get that in Europe, where automakers have more than a hundred years of knowledge and experience and capability. But with the advent of everything that's coming at them in terms of next generation e mobility in vehicles, there is more willingness to rely on a propulsion partner than there was a couple years ago. How will the move away from diesel affect your European production footprint? It is just small change for us. Our plants that make diesel turbochargers today will just make gasoline turbos. Many times, it's the same equipment, it's the same manufacturing line for a diesel as a gasoline turbo. It's the same with an EGR (exhaust gas recirculation) valve or an EGR cooler, which are predominantly for diesel products. We have a couple areas where we make dedicated diesel products, but it's not a big part of our footprint. And what we'll do is we'll just adjust those over to making hybrid- or electric-oriented products. We're not going to go through a massive footprint rationalization as we migrate to the balanced portfolio. In addition, we're going to add a bunch of hybrid-specific products, and we're adding the electric vehicle products. That means we will actually need more plant capacity in the future as we continue to grow. We've been adding plants over the years. We're going to continue to add plants. We're still growing in Europe but most of our growth is in China, where we are still adding equipment and plants. And we're still growing significantly in North America, so we're adding capacity. What’s your outlook for the overall market and for BorgWarner for the remainder of 2017 and 2018? It's a little early to talk about 2018, but for 2017 we see flat markets globally, with small increases in production China and Europe offsetting a slight drop North America. Europe has generally gotten a little better as the year went on, China held where it was and North America got a little weaker. For BorgWarner, however, we see strong growth of 6 percent to 7 percent in terms of production.